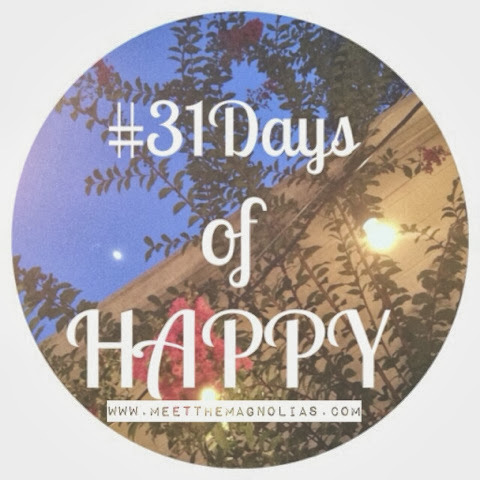 Meet the Magnolias: #31Days of HAPPY! I was reading one of Jessi's pre-Influence Conference posts (www.naptimediaries.com), and that's where I was introduced to this challenge! P.S. Jessi's posts are going to be amazing. Know how I know? Because they always are. That woman speaks to me. So the official link-up starts tonight. I almost didn't even decide to do it. It seems like a lot. It seems like it will require a lot that I don't have together or haven't thought out. But like most things, I was complicating it/making an excuse for myself. So.....I'm writing for the next 31 days about what makes me happy. It may be simple. It may be deep. I just need to write. We'll see what happens! I literally have a list of things I was trying to cram into this idea. I wanted something brilliant and unique. Instead, I'm posting about where I am right now. I want to focus on gratitude for the things that make me happy! By counting my blessings, both big and small, I hope to grow in my thankfulness for all the Lord is blessing me with.